Boston was my home before I moved West. Boston will always be “home” to me, that place I go to see the family (blood and chosen) that made me who I am. This afternoon I received the news that two bombs had exploded at the finish line of the Boston Marathon in Copley Square. Copley is a familiar place to me – I used to work a block away, and I’ve watched the Marathon go by many times, in the past I’ve greeted the runners as they finished their 26 mile run. As usual, when a tragedy strikes, things are chaotic. Reports were coming in from every media source, I sent and received dozens of text messages checking on the whereabouts and well-being of the people I know and love in the area. It’s been six or seven hours since the first bomb went off. We still don’t know who did it. We don’t know the full count of people injured, though there have been two confirmed dead. We don’t know much, and news media simply recycles the same story until there’s something new to add. We are surrounded by images of emotion, of blood and pain and smoke and fire, and incredible videos of people who ran towards the explosion, towards the people there who needed help. There is such a mix of feelings – the pain of knowing that some humans do this to one another, but the hope found in knowing how many come to help, how many come, selflessly, to give, and reach out to one another, strangers united by their humanity. When the dust has settled and we’ve learned more and had time to try to make sense of this tragedy in Boston, perhaps we’ll take a moment to reflect on the fact that being the victims of bombing, whether foreign or domestic, is a terrible thing. Maybe as we heal from this hurt, we can take some time to learn where other bombings have taken place in the world lately. Maybe we can try to help. Maybe we can try to stop them. Maybe we have that power. Maybe it’s time to look to our leaders and demand we no longer be responsible for this feeling we’re experiencing, experienced by others around the world. 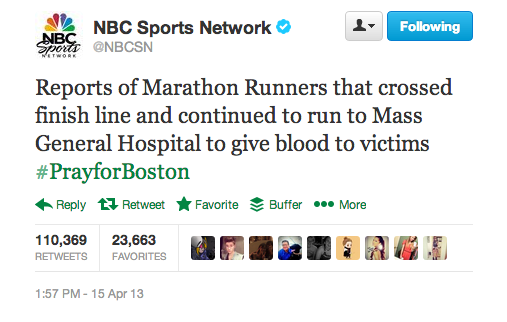 No person, no nation, no people should feel what Boston feels today.